Sorry for being a little late in posting this. It’s been a (shall we say) busy week. Slightly different from years before, I’m only listing books this time—of which there are not as many this year due to other needs. I would have included articles and/or essays, but there simply were too many being read in quick succession and I failed to keep track of them—with the exception of these two: Unknown author(s), “How Long are the Days in Genesis 1?” BioLogos (2018). And Glenn Evans & Joel B. Groat, “Joseph Smith and the Kinderhook Plates: Overview and Current Perspectives.” Institute for Religious Research (2011). ° means: not that impressed. ‡ means: those items where I willingly subjected myself to mental torture (i.e., the item was bad). This is an example of what happens when that which would help make a compelling case (i.e., logic, truth, sound arguments, etc) takes a back seat to the modern rationale: “Hey, you have to believe what I’m saying because I sound really, really excited and passionate about what I’m saying.” …I weep for the younger generations. (for the answer in question, go here). But I guess my follow-up would be: what exactly was your “problem”? Polemics? Thomas Ice? Or something else? [[…]]^ means: I started reading it, but did not finish before the end of December. I’ll do so in 2018. Any others that come to your mind are certainly welcome. 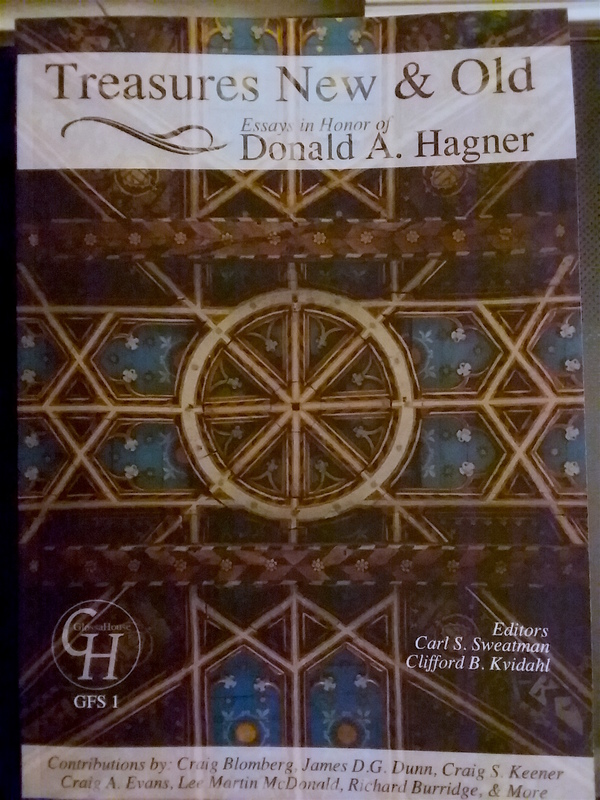 This past Friday night (17-Nov-2017), at the annual IBR meeting in Boston, we had the (brief) opportunity to celebrate the work and contributions of an esteemed scholar in biblical studies and all around delightful guy: Donald A. Hagner. In keeping with such celebrations and feelings of gratitude, we presented Don with a Festschrift entitled, Treasures New and Old: Essays in Honor of Donald A. Hagner. It’s 400+ pages of goodness. While it can be purchased on Amazon, it will be available on the GlossaHouse website shortly.